Norway’s Conservative Party and fellow politicians were mourning the death over the weekend of Jo Benkow, a major figure among Conservatives and a former president of the Norwegian Parliament. Benkow died Saturday at the age of 88. Benkow was best known for his efforts to fight racism and fear of foreigners in Norway. 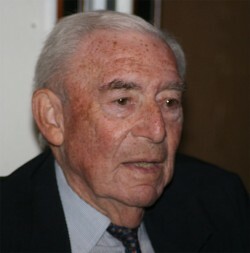 Benkow himself was Jewish and had lost many family members during the atrocities of World War II. He spent a lifetime urging tolerance and respect for differences among people. He was active in the Conservative Party (Høyre) throughout his adult life and became one of Norway’s most high-profile politicians for several decades, especially in the 1980s. He served as leader, deputy leader and parliamentary leader of the Conservatives and was both a Member of Parliament and, from 1985 to 1993, President of the Parliament, which ranks second only to the reigning monarch. Erna Solberg, the current leader of Høyre and its candidate for prime minister, called Benkow “a warm defender of the welfare state under conservative conditions.” She said his commitment to comprehensive welfare programs built on a foundation of social responsibility continues to shape the party’s program. Prime Minister Jens Stoltenberg also expressed his condolences, calling Benkow “a towering politician and a fearless spokesman for tolerance and against discrimination.” Fellow Conservative politicians called him one of the party’s “wise men” and “a pillar” of the party’s history. Josef Elias “Jo” Benkow was born in Trondheim in 1924, the son of a photographer, but the family moved to Bærum, just west of Oslo, when he was a child. He fled to Sweden after Nazi Germany invaded Norway, as did his father and brother, but his mother and other women in the family chose to remain in Norway. They were among the small community of Norwegian Jews who were deported to Germany in the fall of 1942. They were killed at Auschwitz, a loss that left an indelible mark on Benkow for the rest of his life. Benkow eventually returned to Norway and became a photographer like his father but soon became active in the Conservative Party. He was first elected to parliament in 1965 kept his seat for nearly 30 years.